Stuttgart - VfB Stuttgart against Eintracht Frankfurt will draw a huge crowd this Sunday, particularly among football fans in Japan with three Far Eastern stars topping the bill. The press facilities at the Mercedes-Benz-Arena will be bursting at the seams on Sunday when VfB Stuttgart host Eintracht Frankfurt, on account of three of the piece's protagonists locking swords, or tachi’s on the field. Gotoku Sakai, Shinji Okazaki and Takashi Inui are major stars in Japan, an increasingly football-crazy, Bundesliga-loving nation. Sakai was in Japan's 2012 Olympic Games squad and, while the honour of representing his country in such a major event will live long in his memory, the after-effects have taken their toll. Although he has been able to hold down a regular berth in Bruno Labbadia’s team this season, Sakai admits he has yet to reach peak condition after missing most of pre-season. “I still feel a little odd,” he said recently. “I am not as flexible as usual. I am starting to realise how important a good pre-season is." The defender has therefore been putting in extra shifts to improve his fitness. Being left out of the Japan national team squad for games against France and Brazil recently also turned out to be a blessing in disguise. “It's an honour to be called up to represent your country, but this time I'm really glad that I could stay in Stuttgart because that was more beneficial to me." The result was an energetic performance in Stuttgart’s 1-0 win at Hamburg last weekend - one of his best of the season. Sakai is going to have to be even stronger on Sunday, though, as he faces his compatriot Inui. With three goals and three assists in the opening eight fixtures of the season, Inui has made a tangible contribution to Frankfurt’s rise to second in the table. His understanding with expert marksman Alexander Meier suggests the pair have been working together for years, yet this is the 24-year-old’s first season with the club after joining from VfL Bochum in the summer. There, he also showed his worth with seven goals and five assists in the Bundesliga 2 last season, and he has taken the step up to the top flight of German football in his stride. While Sakai and Inui are new to the Bundesliga, Okazaki is already into his third season with Stuttgart. He was one of the pioneers of an influx of Japanese players when he arrived in January 2011 from Shimizu S-Pulse. 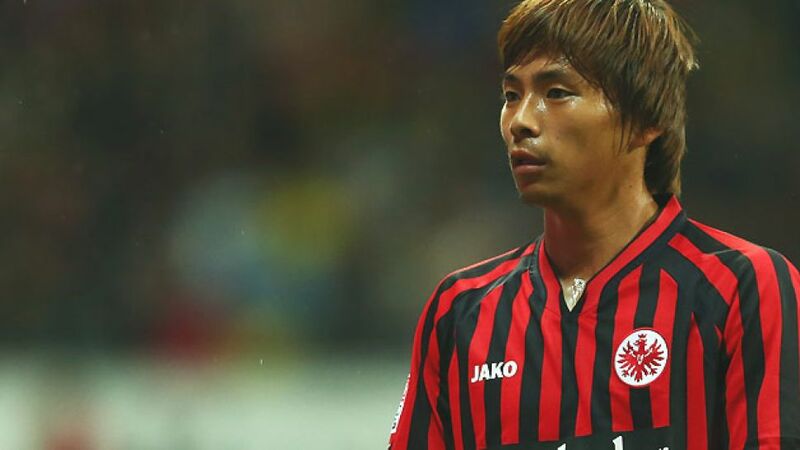 Capped 57 times by Japan, he has scored nine goals in the Bundesliga, but has yet to open his account this season. An ankle injury has kept him out of action recently, but he returned in Stuttgart's Europa League draw with Copenhagen on Thursday and will be eager to grab goal number ten in German football on Sunday. That won't be easy, though. Eintracht currently trail Bayern by five points, but are almost halfway to the magical 40-point mark target for the season after just eight games. Stuttgart, meanwhile, find themselves ten points behind the Eagles, but wll be boosted by last weekend's win in Hamburg. They also have some fresh blood in the team to motivate the squad's older heads: Rani Khedira, brother of Real Madrid and Germany international Sami, is now training with the first team squad and could feature.